Mississippi’s architectural expressions reflect its religious culture. Evangelicalism, a congregationally oriented faith that has often prized simplicity of approach and rigor of doctrine, has not stressed the importance of originality of design. Concentration of the state’s population in rural areas for so long surely shaped religious architectural development, with few large cities providing a concentration of resources for innovative large churches. The predominance of a biracial culture resulted in similarities and differences in the religious life of blacks and whites in the state, including in church building. The presence of a diversity of nonevangelical faiths in smaller numbers than the evangelicals resulted in a variety of styles of church building. The Greek Revival style had an enormous influence on church building in Mississippi, as in the rest of the South. It was a national style, a high-style design, but it cut across denominational and social class lines as Mississippians adapted it to local contexts. 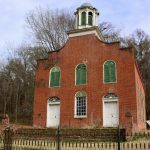 The Kingston Methodist Church, a small church near Natchez built in 1856, is a good example of the Greek Revival style, built of brick and then stuccoed to approximate the stone that the Greeks would have used. Worshippers walked through Doric columns that lent a stateliness to their religious experience. 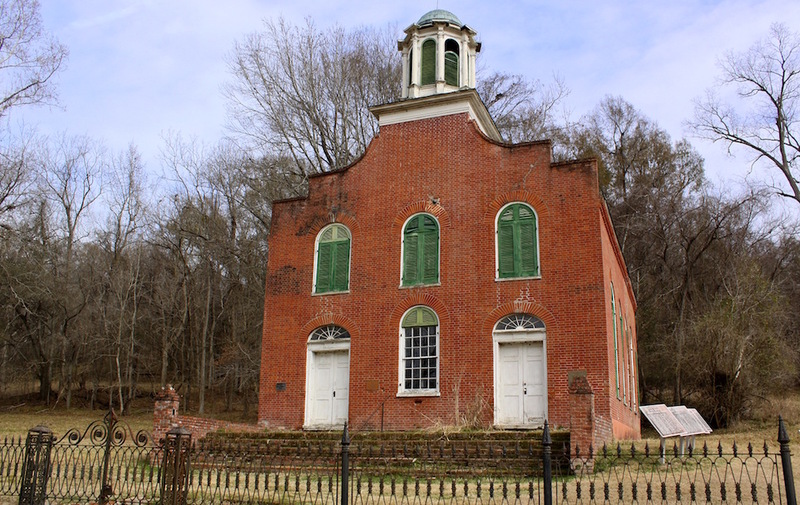 By 1860, Methodists in the state had built 454 churches, many of them Greek Revival. The Baptists also grew dramatically in antebellum Mississippi, and their churches were often vernacular adaptations of the Greek Revival style. Mashulaville Baptist Church, built in 1855 in Noxubee County, in eastern Mississippi, is a surviving example. The wood-frame Bethel Presbyterian Church in Lowndes County is an example of a surviving Greek Revival church built in the antebellum era in the prairie region. Pattern books coming from northern architects were well known in antebellum Mississippi and showed local carpenters how to build small-frame Greek Revival churches. Another popular style was the Gothic Revival. High-church advocates in England’s Anglican Church known as the Ecclesiologists promoted a return to medieval church styles, including stained glass windows, images of saints, dim lighting, stone altars, and other features that represented a Victorian Romanticism. Richard Upjohn became a prominent American exponent of Gothic Revival after the success of his Trinity Church in New York City led to a demand for similar design plans adaptable to other places. Upjohn’s Rural Architecture (1852) enabled builders to construct wooden churches featuring board-and-batten walls, shingled and pitched roofs, and lancet windows with splayed jambs. A square tower typically contained the belfry and a broach spire. The Episcopal Church, the American branch of the Anglican tradition, became a prime builder of Gothic churches in the nineteenth century. Mississippi had relatively few Episcopalians, but they built fourteen churches in the antebellum era, mostly expressing Gothic design. The Chapel of the Cross, in Madison County, north of Jackson, is a small plantation chapel built as a memorial to John T. Johnstone, a wealthy planter. Completed in 1853, the church was designed by Frank Wills, an Englishman who became the architect for the New York Ecclesiological Society and designed Grace Episcopal Church in Canton. Both of Wills’s Mississippi churches embody a pointed style, with Grace Church utilizing arches and pinnacles to achieve the vertical visual reach favored by Gothic designers. Many rural churches in Mississippi were vernacular or folk buildings, relying on customary ways of construction and building plans that did not reflect formal architectural training. Such high styles as Greek Revival and Gothic Revival have been frequently adapted in country churches. Some folk churches were and are one-story rectangular structures, with gabled roofs and one or two doors. Examples include the Bethany Presbyterian Church, near Centreville in Amite County (1855), and Lebanon Presbyterian Church, near Learned in Hinds County (1854). Both have two doors at the entrance, which tradition suggests were separate entrances for men and women. Other folk churches were two stories, with the second floor used by a fraternal lodge hall: the Shongalo Presbyterian Church in Vaiden (1874) is an example. Finally, vernacular churches have sometimes been built as gable-roofed, rectangular buildings with a single large, high-ceilinged room and a gallery that overlooks the lower level. An example is the Washington United Methodist Church, northeast of Natchez (1828). Slaves typically sat in church galleries for worship, creating a unique biracial church tradition. With the end of slavery, African Americans withdrew from these churches, seeking spiritual autonomy. They built countless places of worship, favoring the prevailing Gothic Revival style but using a variety of other designs as well. Vicksburg’s Bethel African Methodist Episcopal Church, which opened in 1864, was the denomination’s first congregation in the state. In 1912 its members constructed a Romanesque Revival building that still stands. The Delta, the area of the state with the highest concentrations of African Americans, is characterized by large numbers of small frame churches, often Missionary Baptist in affiliation. Bell towers are not unusual, towering over the adjacent burial grounds and nearby cotton fields. Each interior typically has a central wooden podium, substantial wooden chairs, and a communion table in front of a railing that separates the seated congregation from the altar. More recent Delta churches are likely to be of brick, with spires atop pitched roofs. Roman Catholics were not numerous in most areas of nineteenth-century Mississippi, but nine parishes had been established by the time of the Civil War. Annunciation Parish, established in Columbus in 1854, prospered during the cotton boom of the 1850s and even in the early years of the war, encouraging the congregation to begin construction on a Gothic Revival building. The war’s devastation prevented the church’s completion until 1868, however. Rodney’s Sacred Heart Catholic Church, also completed in 1868, is a small building with lovely tall windows and a square tower. Most of the state’s post–Civil War Catholic churches were constructed in a High Gothic style exemplified by Jackson’s Cathedral of St. Peter the Apostle, built from 1897 to 1900, and Biloxi’s Cathedral of the Nativity of the Blessed Virgin Mary, built in 1901–2. The Gulf Coast was traditionally the center of Mississippi’s Catholic population. The center of the state’s largest parish, Bay St. Louis’s Church of Our Lady of the Gulf, had three thousand communicants in the 1930s. Its members worship in a red-brick Italian Renaissance building that was constructed between 1908 and 1926 and features stained glass windows from Germany. Holy Family, the first African American Roman Catholic Church in Mississippi, was built in Natchez in 1894. The Third Plenary Council of the Church had authorized establishment of separate black parishes in 1885 in hopes of evangelizing African Americans, and Holy Family was one of the first results of the effort. This brick Gothic Revival Church remains in use. The Civil War resulted in the destruction of many Mississippi churches and halted the construction of new facilities. Postwar political turmoil and economic decline held back church development, and the state escaped the swirl of newer national architectural styles. Congregational stories preserve memories of local church experiences with the war. For example, both Union and Confederate troops sheltered their horses in Holly Springs’s First Presbyterian Church, which was under construction when the war began. Rodney’s Presbyterian Church, built in 1830, has a cannonball lodged near the center of the building. As the postwar South romanticized the Old South and the Lost Cause, Greek Revival buildings, including churches, gained new cultural authority in Mississippi and remained popular even after losing favor elsewhere. As the state’s towns and cities grew in the late nineteenth and early twentieth centuries, they typically included examples of monumental churches. The “First” Baptists, Methodists, and Presbyterians on town squares were good examples, with Churches of Christ also represented in some towns in northern Mississippi. Religious architecture in Mississippi has reflected Christian predominance, but Jewish Mississippians, too, have built distinguished places of worship. Jewish settlers arrived in the state early in the nineteenth century, and Jewish cemeteries existed in Biloxi and Natchez as early as 1830. Later generations of Jewish immigrants from Central and Eastern Europe worked as peddlers and shopkeepers, settling in isolated small towns in the Delta and elsewhere. 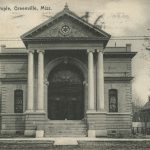 By 1860 at least six Jewish congregations existed in the state, including Gemiluth Chessed in Port Gibson, established in 1859. The congregation’s Moorish-Byzantine facade, erected in 1891, is one of the state’s most exotic structures. Its architects planned it to resemble synagogues found in Russia, where many of its members had originated. Brookhaven’s Temple B’nai Sholom, built in 1896, also uses Moorish touches in windows and on tower panels. 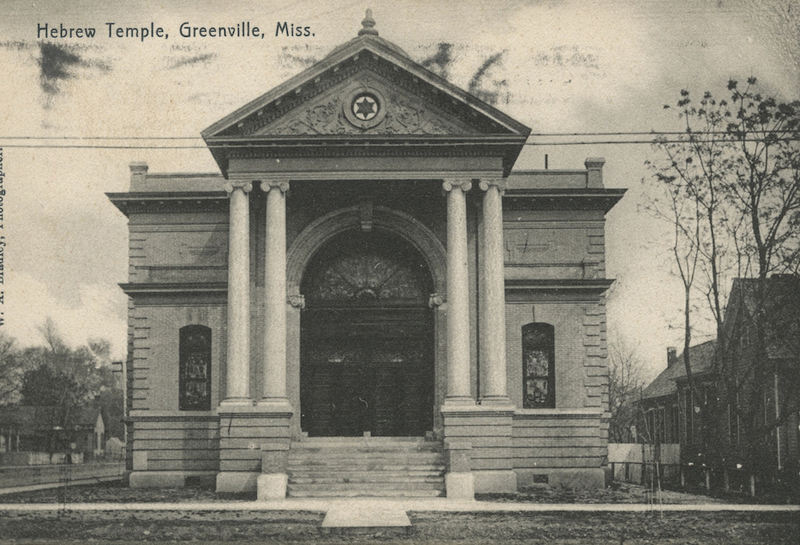 Temple B’nai Israel in Natchez (1905) and Hebrew Union Temple in Greenville (1906) are Classical Revival buildings. The contemporary era has seen the growth of megachurches in Mississippi’s urban areas. Jackson’s First Baptist Church, founded in 1838, had 8,855 members in 2007, while another of the city’s largest churches, Christ United Methodist Church, had 4,946 congregants. Their facilities include abundant classroom space, exercise rooms, kitchen areas to support feeding ministries, and health clinics. The descendants of the small vernacular rural wooden churches are double-wide trailer churches such as the Rising Sun Missionary Baptist Church in West Jackson. Its members began worshipping in 1994 in a private residence and moved their services into a new sacred space in 2001. Few religious symbols mark the outside of the church, and it hardly draws on historic church architectural patterns, but evangelical images meet the worshipper in an interior that reflects the simplicity of an unadorned evangelical church. Evangelical churches in Mississippi often use their interiors as auditoriums to facilitate the oral dimension of worship. The liturgy is focused on the preacher’s sermon, congregational hymn singing, and prayers, and an auditorium design provides for individual seating in curving tiers that rise toward the rear and a large stage with a prominent pulpit, space for the minister to roam while preaching, and seating for a substantial choir. The assembly hall is often surrounded by classrooms where Sunday school students meet and then move easily into worship space.